Research is critical to ascertain the approximations in reality of a given circumstance. Without it we would be operating mostly off of faith, trust & intuition. It is important to be aware that objectivity isn't always so objective as well. A balance between intuition and logic is critical to achieve honest and compassionate research. Many scientists and researchers will claim something as an absolute fact, however time has shown that there are few absolutes, if any. The deeper our understanding and willingness to keep an open mind the deeper our research will be. It is very important to be aware that research, scientific abstracts, studies and trials are often manipulated by many within industry in order to sway consumer choice or corporate interests. 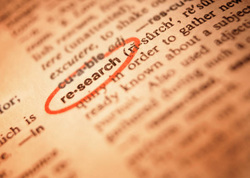 Where do we get our research? We investigate a variety of different scientific journals, government & university websites in order to provide you with the most accurate information we can find. If you have websites or other resources you would recommend to increase our research resources e-mail us. We must shift our belief from buyer beware to Buyer Be Aware. The buyer beware model implies we must beware that someone will inevitably screw us. The buyer be aware takes a stance that goes more toward asking questions and expressing observations when something comes up that concerns us or just out of curiosity. It isn't laced with the assumption every company or government is out to do you over. While we do encourage you to express your passion if you are angry with the current systems it is also helpful to research your subject or topic of concern. In order to raise awareness effectively we must remember that the most effective long-term approach is through research and passionate expression of our concerns. We encourage you to question and investigate everything. Especially if it does not resonate with you.